Kate Thornhill, of Suttons Bay, hopes to set a world record for the largest raft made of canoes and kayaks. SUTTONS BAY, MI — Kate Thornhill is used to difficult challenges; she has traveled solo more than once deep into the Minnesota Boundary Waters paddling the wooden kayak she built. But on Sept. 1, she is going for the gold: a spot in the Guinness Book of World Records. 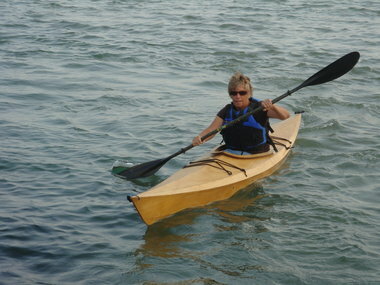 And Thornhill, a certified public accountant, hopes 2,000 or more paddlers will join her. The Holland native is organizing an event called the Sutton’s Bay Floatilla with the intent of breaking the world record for the largest raft of canoes and kayaks ever to float together. The current record is 1,902 canoes and kayaks. That was set last September on Fourth Lake in New York’s Adirondacks. That event was called “One Square Mile of Hope.” It was sponsored by the Central Adirondack Paddlers Society. The event, a fundraiser for Susan G. Komen for the Cure for breast cancer research, drew paddlers from 14 states. Photos of the giant raft of boats made Sports Illustrated and National Geographic. “I couldn’t get the vision out of my head of what it would look like on Suttons Bay waters,” Thornhill said of the inspiration she had upon seeing photos while hiking in Utah with a friend who had participated. “I thought this would be a great fundraiser for our schools. I am hoping it will raise in excess of $50,000,” said Thornhill, a mother of two. Her son, a senior at Suttons Bay High School this fall, will be floating alongside her. The proceeds will go to the Suttons Bay Schools Student Activities Fund for programs that no longer get public funding, such as a team-building camp that parents now pay for. “The money will pay for kids whose families cannot afford it,” Thornhill said. The official count for the Suttons Bay Floatilla begins at 12:45 p.m. Boats must be launched by 12:30 p.m. Only those who register can participate. Paddlers can register online at www.sbfloatilla.com. Thornhill, a professional guide for Adventures in Good Company, a woman’s adventure-travel company based in Baltimore, Md., got “addicted to kayaking” 12 years ago. She has been to the Minnesota Boundary Waters nearly 20 times, she said. The northern Michigan event will be a family-friendly affair. “We’re getting interest from a diverse group of people. We have people coming from Chicago, New Orleans, Rhode Island and Arizona,” Thornhill said. Guinness World Record rules specify only kayaks and canoes are allowed. No boats can be tied together. Inflatable canoes/kayaks and standup paddleboards are not permitted. The raft of boats has to float without touching shore or bottom for 30 seconds. The Suttons Bay group will have competition. An event called Floatzilla, which can be found at www.floatzilla.org, is mounting a challenge. That event was Saturday on the Mississippi River at Davenport, Iowa. Official results are months away. That attempt to get 2,000 boats in 2011 fell short with only 1,535 canoes and kayaks. It also was short of a 2010 Pittsburgh Guinness record-breaking event called “Paddle at the Point” which drew 1,619 canoes and kayaks. You can find a time-lapse clip by visiting www.paddleatthepoint.com. “I don’t think it (Floatzilla) is a serious challenge,” Thornhill said. Michigan has received a lot of news coverage for being a travel destination. Having a world record like this would reinforce that Michigan has places to visit and things to do. So, if you’ve got a canoe or kayak of any sort — it is not an event that will require considerable skill — consider putting the Sept. 1 floatilla on your calendar and the boats on your car. It is bound to be a good time, win or lose. This entry was posted in Uncategorized and tagged Canoe, Canoeing, Guinness World Record, Kate Thornhill, Kayak, Kayaking, Paddling, Suttons Bay. Bookmark the permalink.